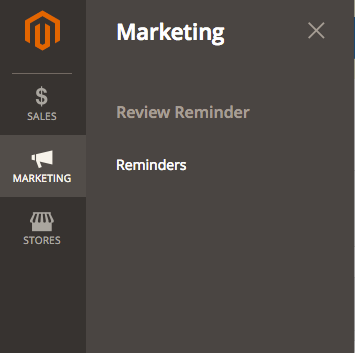 Review Reminder for Magento 2 is an extension that automatically reminds your customers via email to leave feedback for products they recently purchased from you. Save time and effort, and boost your sales by collecting multiple reviews for every item bought from you. People tend to believe reviews and look for them before making a purchase. With Review Reminder extension you won’t wait long for the first review for the product to appear. With every review added you will know the state of consumer demand for specific items and see more useful remarks on how to make your customer service better. One of the criteria for potential customers to choose your store among thousands of others is feedback. The more reviews you get, the more possibilities you have to attract new customers and gain trust amongst them. Items that already have some reviews draw more attention than not reviewed ones. Reviews are an efficient marketing tool that your customers make work for you. Your only task is to encourage them to provide feedback and improve their customer experience with extra activities. There is an option to apply coupon generation to personally reward the customers for the reviews with a specific discount of your choice. 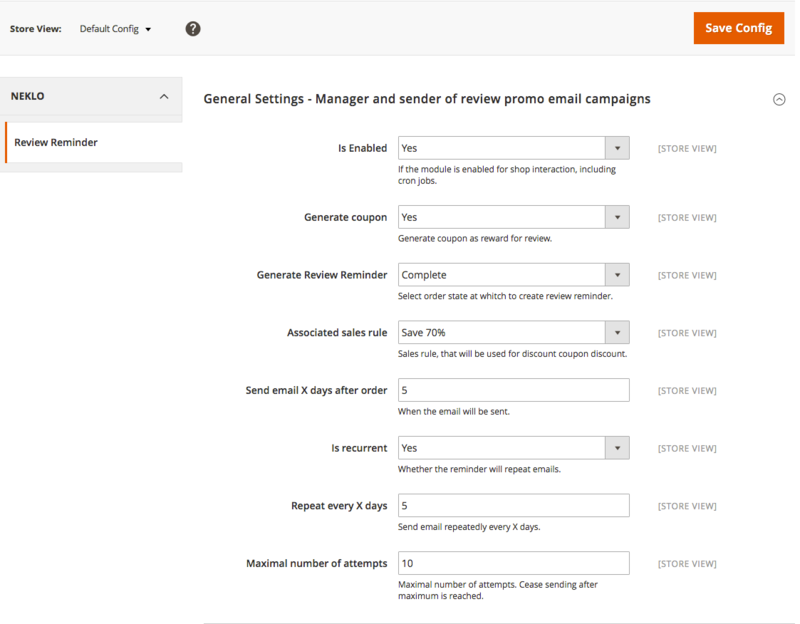 Review Reminder extension can handle email dispatch in automatic mode, but every single detail can be configured manually if needed. The extension functionality is flexible and can be adjusted to your store activity. Such options include a delay period for a reminder and notification frequency. Review Reminder allows to group the reminders for all orders placed by one customer into one email and set the time and the order status after which they will get a notification. You are not limited to one specific layout. 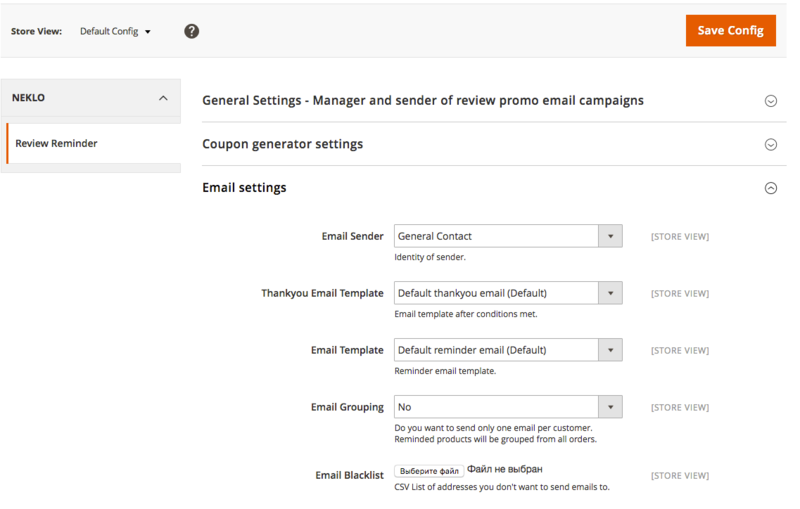 Select the sender, change the reminder and email template, and associate a discount size or a sales rule for the coupon if you provide one for submitting a review. Select how often you want your customers to be reminded about leaving a review. Choose what order status requires a review reminder. Specify the time after the order the notification should find its way to the customers, how often they should be repeated and how many attempts there should be. If there are customers that mind getting notifications from you, that is not an issue. 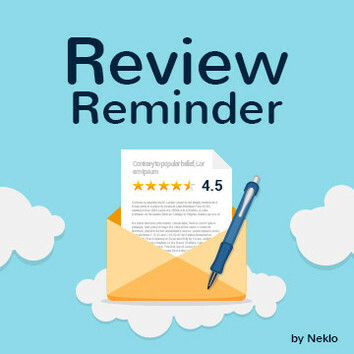 Review Reminder allows to upload the list with emails you don’t want to dispatch notifications to in the form of CSV file. 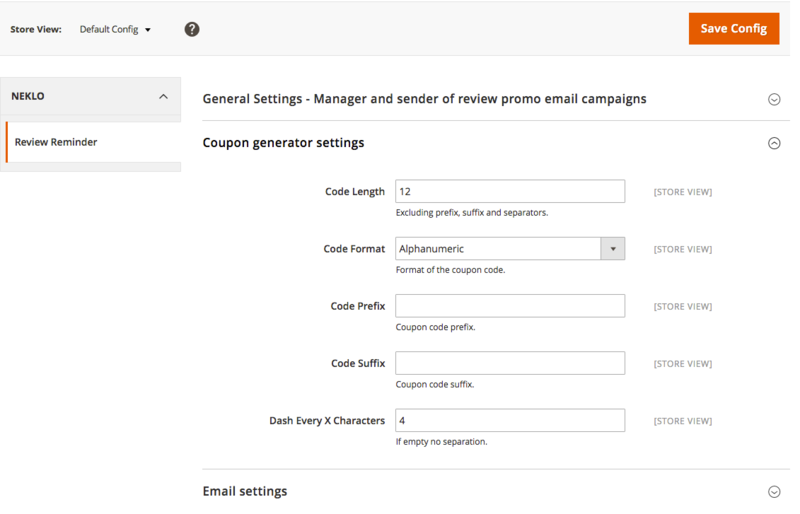 Adjust the coupon generating settings to your needs. You can specify everything about the coupon code, including its length and format, suffixes, prefixes and dashes. Review Reminder Magento 2 extension not only helps you to sufficiently increase the number of reviews in your store but also demonstrates your brand’s commitment to work and willingness to improve. Having lost a lot of days trying to make this plugin work, but when i rise a ticket in their support portal i got immediate solution. and now everything seems to be fine. one of the better plugins with better support.